What is it that makes certain athletes world-class superstars and others, just average? It’s part nature: some people are simply born with the capacity for exceptional feats. But unless they channel that ability through rigorous training, their capacity gets them nowhere. Success requires innate ability, but also self-discipline. According to George Day, top businesses have a lot in common with top athletes. His research examines the qualities that separate “growth leaders” from “growth laggards” — in other words, the qualities that separate average or failing companies from those that achieve Olympic-level success. Like athletes, Day says, successful firms must possess certain strengths — “abilities to partner, to network, to do adaptive experimentation, and so on” — then apply these strengths in a deliberate, systematic manner. “Innovation prowess” is Day’s name for this crucial combination of ability and discipline. In the business context, discipline refers to the strategic pursuit of growth opportunities. “Companies, interestingly, have more growth opportunities than they can handle,” Day observes, “but they may not be the best ones.” Companies with innovation prowess will carefully analyze the available opportunities, and then invest heavily in only a few. In the video above, Day offers five key lessons that he believes all managers can apply to build their innovation prowess and seize the best growth opportunities. The stakes couldn’t be higher: While top athletes may choose to compete for mere fame and fortune, companies have no choice but to compete for their very survival. 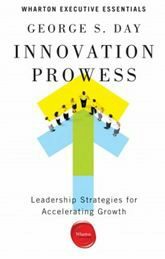 George Day’s latest book, Innovation Prowess: Leadership Strategies for Accelerating Growth, is available from Wharton Digital Press.